Polymer clay doesn’t have to be as intimidating as some people think it is! 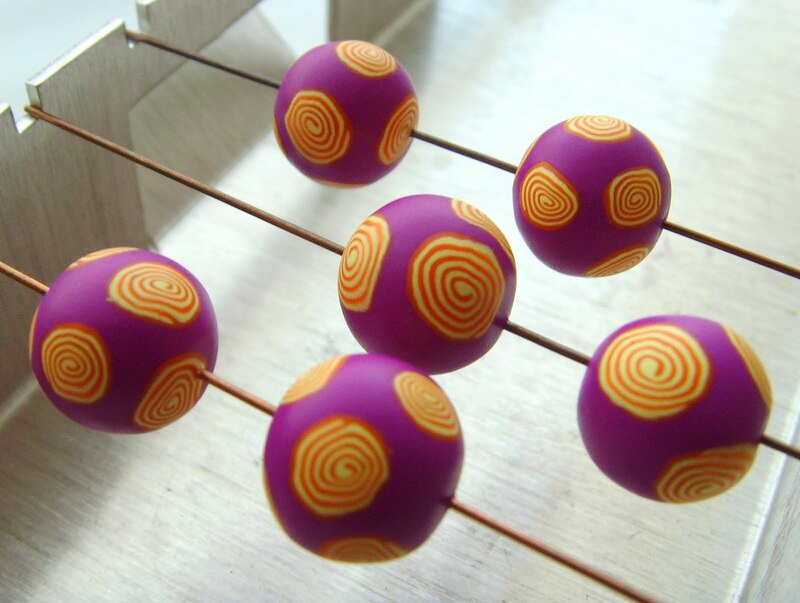 Many people don’t realise that you don’t need a lot of tools to get started with polymer clay. This tutorial will show you how to make a basic spiral (ideal for beginners), using only clay, an acrylic roller and a tissue blade! You don’t need to use a pasta machine with this tutorial, but you can use it if you do have one. Just roll the clay through the machine on a number 4 setting to achieve the correct thickness. 1. Always condition the clay well before use. This ensures that it is soft and not too brittle, making it easier to work with. Do this by working the clay in your hands; the warmth of your hands combined with rolling and folding makes it much more pliable. 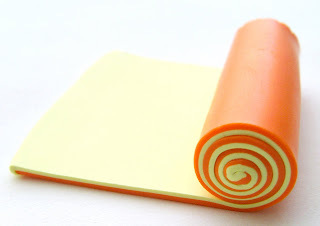 Roll out two sheets of clay approximately 1-2mm thick, either with your acrylic rolling pin or pasta machine. It helps if these are rolled so that the sheets are long and narrow and each should be rolled to approximately the same size. 2. Place one sheet on top of the other and gently roll over to remove any trapped air and ensure that the two sheets are adhered together. 3. 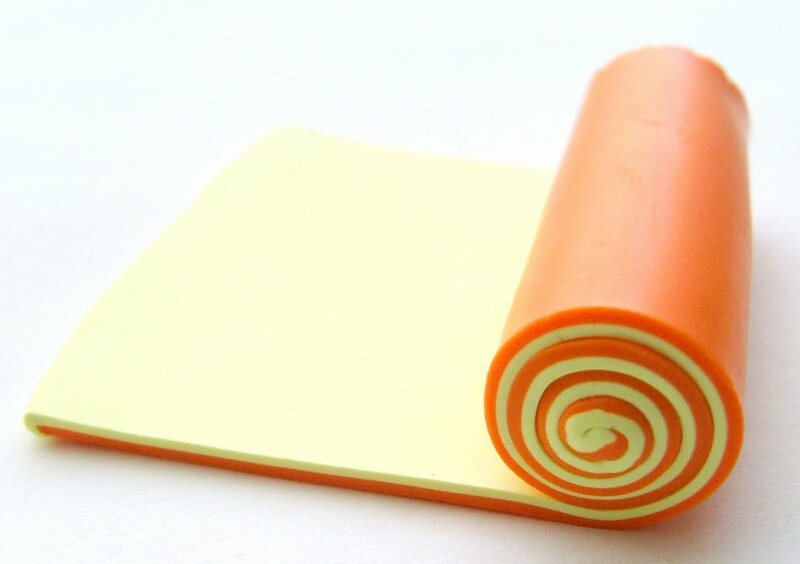 Before you begin rolling, cut one edge straight and trim down the sides slightly if needed. Roll tightly to avoid trapping any air. 4. Continue rolling, keeping the edges straight. Just before you roll the last part, cut the edge straight. Use your fingers and gently roll to make the seam more secure. 5. Roll the cane upon the work surface to reduce it down, always keep your hands moving along the length to keep it the same diameter. 6. Once you are happy with the size, you can begin slicing. It’s often a good idea to cut your cane in half so that you can reduce one half smaller than the other. 7. To slice the cane ready for applying to your beads, it is best to allow the cane to cool slightly. You can speed this up by placing your cane in the fridge/freezer for a short period. This will stop it warping as you slice through it. The thinner the slice, the better the result, as the clay will spread less when being applied to your bead. As you cut each slice, rotate your cane slightly to prevent distortion. 8. Make a round bead by rolling a piece of clay between the palms of your hand in a circular motion. To make sure each bead is an equal size, you can roll out a larger sheet of clay and use the same size cutter for each bead or roll a log and cut equal lengths each time. 9. Now you’re ready to apply the slices to your bead; simply cover it with as many slices as you need! Press each slice very gently to make it stick. 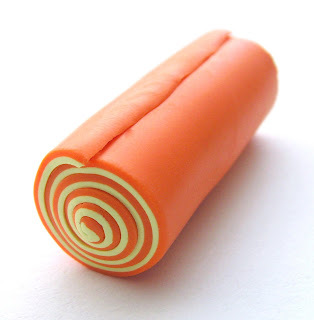 Roll in your palms until there are no more ridges along the cane edges. Allow to settle for a short time before piercing to make a hole. 10. The beads are now ready to bake, following the manufacturer’s instructions!